Who needs therapy when you have a bottle of Baileys, some Dagoba cocoa powder, a beautiful stainless steel Kitchen Aid and a little time to kill? Well, in all honesty, I had NO TIME to kill; infact I was trying to get kids ready for school, pack lunches and get myself ready for work. But that’s neither here nor there. 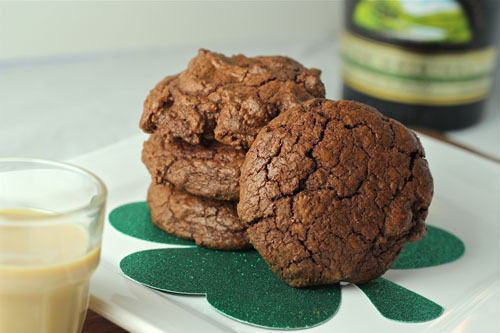 Categories: Chocolate, Cookies | Tags: Baileys chocolate cookies, Baileys cookies, double chocolate chip cookies, Irish cream cookies, St. Paddy's Day recipe ideas, St. Patrick's day cookies, st. patrick's day recipe ideas | Permalink. 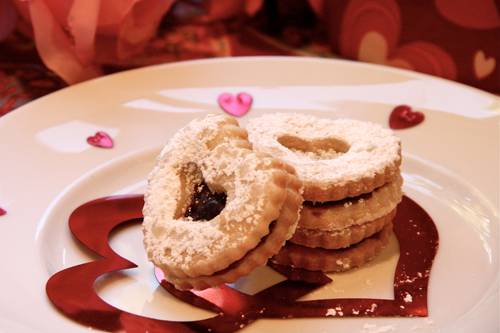 Categories: Cookies, Valentine's Day | Tags: butter cookies with jam, Ina Garten's Linzer Cookies, Mini Linzer Cookies, Valentine's Day cookies | Permalink. 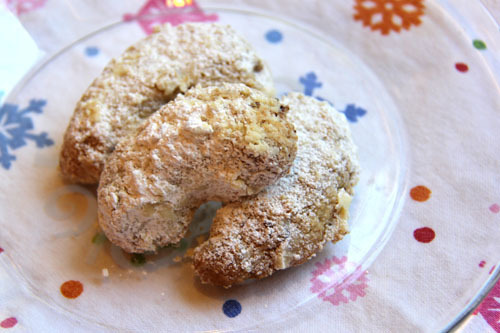 I will start and end this post with my family’s favorite Christmas cookies, Katina’s Greek Crescents. They are made with pecans and dusted with powdered sugar and bite after delicate bite literally melts in your mouth. I actually never knew Katina, nor really know how she fits into my family’s life. I just know she must have been one heck of a baker and that officially gives her my seal of approval. Categories: Cookies | Tags: butter and powdered sugar cookies, crescent cookies, Greek cookies, how to bake cookies, why is do my cookies spread out? | Permalink. 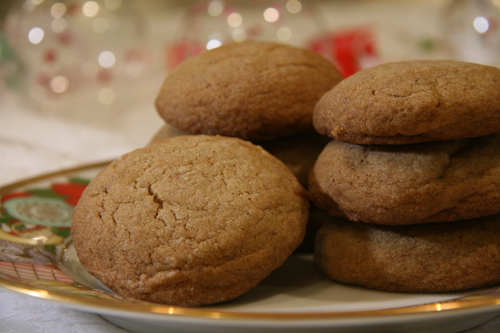 Categories: Christmas, Cookies | Tags: baking Christmas cookies, Christmas cookies, Christmas cookies gift plan, ginger crinkles | Permalink.